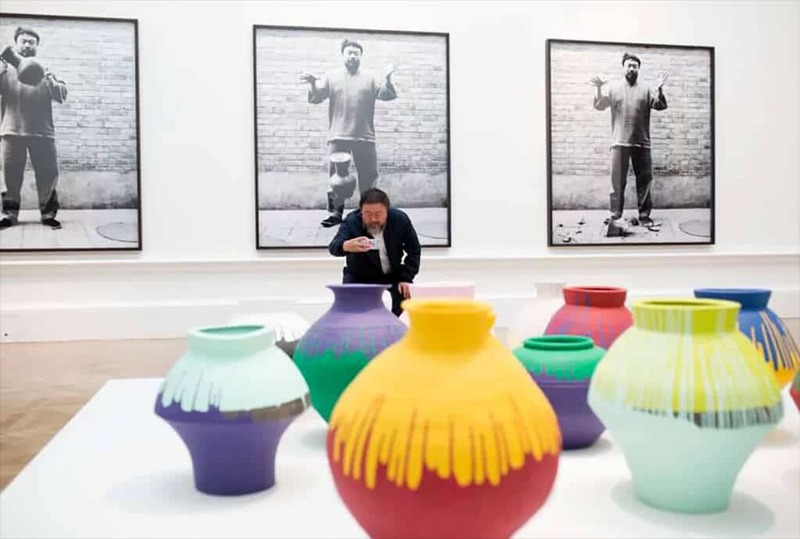 Ai Weiwei’s first major survey in the UK is a better looking exhibition than I had anticipated, but what it gains in looks it sadly lacks in substance – backstory and information not being quite the same. It’s visually satisfying, since Ai initially impresses with the sheer scale and elegance of some of his larger pieces – a combination of readymade and crafted materials which include chandeliers incorporating wheel and bicycle frames, rusted steel rods spread out like gently lapping waves in the Royal Academy’s spacious central hall, and a grove of petrified-looking trees rising up to greet Sir Joshua Reynold’s dandified statue in the forecourt. What looks like a battered leather armchair incongruously placed by the side of this temporary copse actually turns out to be carved from black marble. You’d never have guessed, but then the trees aren’t what they seem either, since they are made from the recycled remnants of felled trees, stripped and bolted together. But often, as we find here, it’s hard to gauge what meaningful relationship one object has to another. Ai’s blandly surreal juxtapositions seem so often to be half-hearted mise en scènes in search of a stage set. 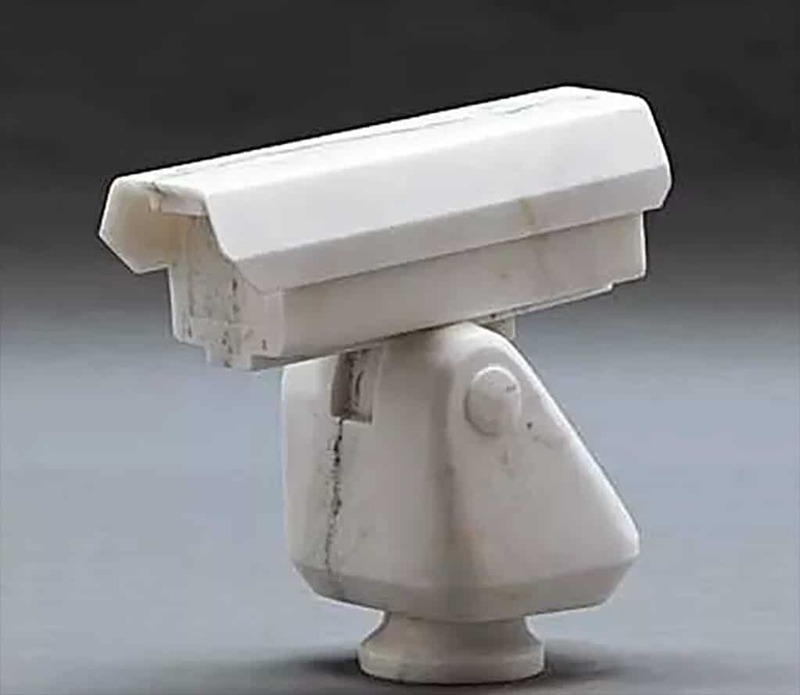 One gallery is filled with things in white marble: a life-size pushchair on a square of grass, with a surveillance camera (a recurring motif in Ai’s work, referring to the constant surveillance of his studio; pictured below) on a plinth in one corner, a camcorder in another, and a gas mask nearby. The tufts of marble grass are huge, so appear out of kilter with the pram. This looks like a miscalculation rather than a deliberately sinister framing. There’s something rather bathetic about it. Ai is, of course, better known for his defiance of the Chinese authorities than for his work, although his Turbine Hall installation of porcelain sunflower seeds at Tate Modern was widely seen and written about when it was shown in 2010, both because he’d already achieved recognition as a celebrity dissident and because the piece soon proved a health and safety hazard. It was swiftly cordoned off from the public due to dust emissions when crunched by so many feet. The piece itself was underwhelming, though many spoke in hallowed terms of its apparent allusion to the Great Famine under Mao and the sunflower seed as a symbol of Chinese resilience and social life. Often it was the only reliable food source during periods of great hardship. But it struck me that there was something insensitively tone-deaf about the project. There were one hundred million individual seeds in all, and Ai had recruited 1,600 workers over a period of two and a half mind-numbing years to make and paint each tiny, hidden porcelain seed. Marina Abramovič’s foray into Zen mindfulness as showy performance art, in which she instructed participants at the Serpentine Gallery to spend hours counting rice, pales in comparison. Self-negation in pursuit of enlightenment is not quite the same as self-negation in the service of the artist’s ego. It’s grim, too, when one thinks of all those pots, some ancient, some prehistoric, that Ai’s dipped in industrial paint, or else painted with a Coca-Cola logo or deliberately smashed to the ground, having recorded the smash-up with a blown-up photo triptych: we see Ai placidly hold the pot, Ai release the pot, then the pot smashed to smithereens at his feet (see main picture). The iconoclasm feels borrowed, like so much of his work feels borrowed. 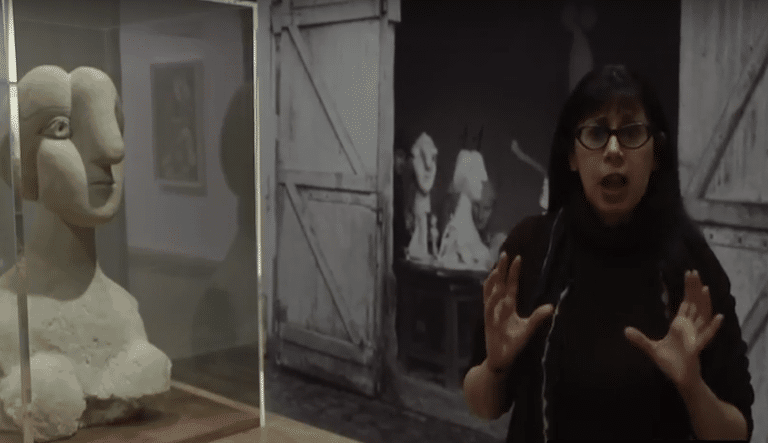 It’s the derivative language of Duchamp, minimalism, protest art and Pop and it feels stale in his hands, as if the ideas the work is meant to embody are detached from the work itself. This feeling of the idea being “tagged on” but not embodied may be because Ai’s activism comes way before his art, though Ai himself says he makes no distinction between his activism and his art. With a central work like Straight, we learn that all those rusted steel rods are the rebars from jerry-built schools that collapsed in the Sichuan earthquake of 2008. Sixty-nine thousand people were killed, many of them children. Ai bought the steel reinforcing bars in bulk anonymously, and had them straightened. As part of the piece the names of some of those who died are listed on one long wall. Before he made the piece, Ai, along with some of the parents, had set up the Citizens’ Investigation into the earthquake, collecting the names of the children and publishing them on his blog. The authorities, who were keen to play down the numbers killed, shut the blog down. While attending the trial of an earthquake activist, police broke down the door to his hotel room in the middle of the night and beat him up. He recorded much of this with a camera. As a result of the attack he suffered a brain haemorrhage and needed an emergency operation. He recorded his recovery in hospital, too. Ai is undoubtedly brave for continually defying the authorities. His arrest in 2011 at Beijing airport and subsequent incarceration for 81 days at a secret location (a trumped up tax evasion charge followed his release) has given rise to a recent work, a series of six metal boxes containing a half life-sized model of his cell, featuring realistic half life-sized models of himself and his two guards. In his tiny cell – meticulously rendered here as dioramas viewed through glass aperatures – the prison guards kept a watchful eye on him 24-hours a day, but were instructed to not speak to him. Given no date for his release, with no actual charges at that point that he could deny, and having no contact with the outside world, one can only imagine the acute psychological stress he underwent. But there’s both a seductive enchantment and an impassive remoteness in such a literal and colourful illustration. Like those toy town miniature villages amalgamating famous landmarks this feels almost cute, and it’s robbed of any real power.